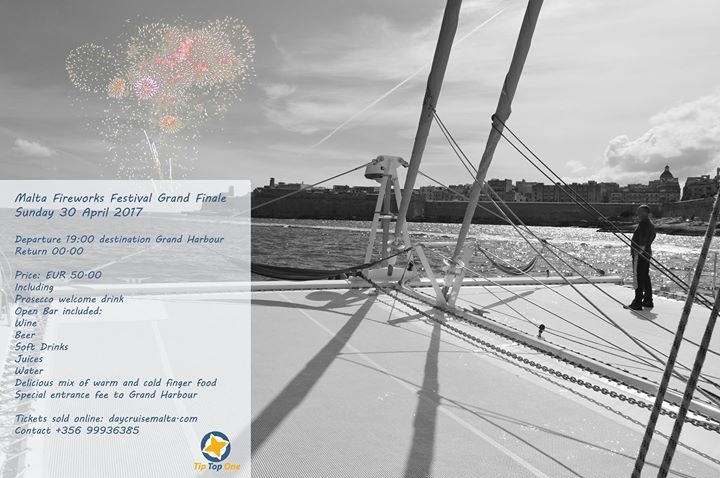 Enjoy the grand finale of the Malta International Fireworks Festival in the Grand Harbour on Board Tip Top One. The 16th edition of the Malta International Fireworks Festival is a showcase of the best of Maltese aerial pyrotechnic talent that vies with international firework companies. Do not miss the opportunity to see the finale in first row on board of Tip Top One. We limit the guests to a maximum of 70 persons instead of 120 maximum possible persons, like that everyone has unobstructed views from the large open deck of Maltas largest day cruise catamaran.